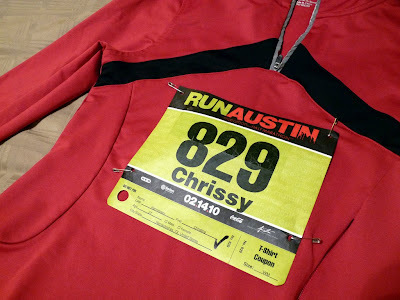 Better Than Never: race report: austin marathon 2010! 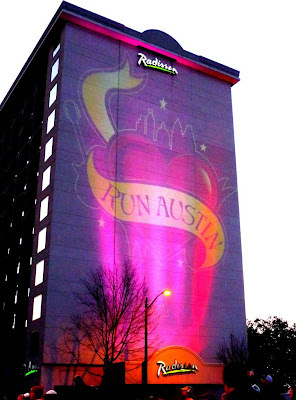 race report: austin marathon 2010! Pinned up and ready to race! As I am sure you are all well, well aware, this past weekend Nathan and I competed in - and completed! 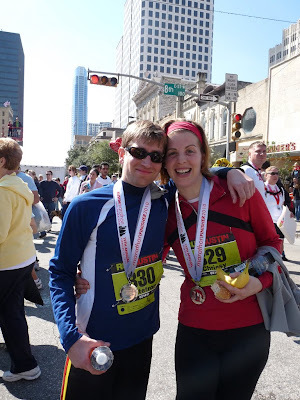 - our very first marathon. After eight months of training, many blisters, sore muscles, and the sacrifice of toenails, evenings with friends, and lazy afternoons, it's over. We have our medals, our memories and - yes - a few more sore muscles. Was it worth it? Absolutely. Below you will find a mile by mile recap of the race, complete with photos. The photos were all taken by my amazing friend Jen. Not only did Jen and her husband Matt host us for the weekend, but they also drove us to the start of the race, cheered us on (along with a few other friends) at key points during the race, took us out to lunch afterwards, bought us a congratulatory six-pack, and made sure we had everything we needed at every moment of our stay. And all of this on Valentines' Day, no less! I don't think we would have had nearly as fun a time running the marathon without their support. So thank you for everything, Jen and Matt! You are both amazing! Miles 1-5. The first few miles of the race were a gentle uphill. I actually like running on hills, and these were not so big. I was right up front with my pace group and holding steady, enjoying the sites and sounds of Congress Avenue and thinking, "Oh my god. I cannot believe this is actually happening." The crowd was supportive, there were a few bands playing along the sidelines, and I passed two college kids cheering us on while drinking PBR's at 8 in the morning. Nice! Miles 6-10. This was the best part of the race for me. I was feeling so strong, so great, that I had to slow myself down so as not to pass the pace leaders! We ran over a bridge and this was the first time I saw my friends - Jen, Jo, Shannon and Anne looked so happy to see me and I did a flying leap as I passed them. This was the best day of my life! Miles 11-15. And then things went downhill. Not literally, though. Literally, they went up... and up... and up. That's right. Hills. Remember when I said I actually liked hills? Apparently, I lied. The 4:30 pace group, with which I had been running since the start, began inching away from me and I couldn't close the distance. Goodbye, 4:30 marathon! At the top of one of the steepest hills, I saw the turn off for the half marathoners. I thought about following them, but quickly pushed the idea out of my head and thought instead about all the people who had donated to Doctors Without Borders in our name. I paid attention to the spectators and read their signs - "Trust Your Trainining," "You Can Do It!," "Toenails are Overrated." I kept moving. Miles 16-20. This is where I hit rock bottom. I had just stopped to stretch out a side stitch and eat an energy gel, and was thinking mournfully about how far I still had to go, when I heard a voice behind me calling my name. It was a girl from SFA, who I'd seen briefly at the beginning of the race. We ran together for about half a mile, chatting about how close we were to the end (!). Then she put her buds back in her ears and pulled ahead, but it was just the distraction I needed. I could do this. I would do this! I kept moving. Miles 21-25. The 4:30 pace group was nowhere to be seen, and I was okay with that. I hadn't been passed by the 4:45 group yet, so I knew I'd finish in less than 5 hours - which was my ultimate goal. 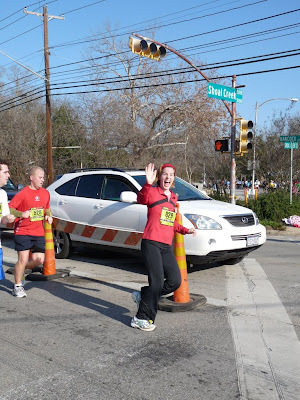 At mile 24, I passed a person who was cheering. "Go 4:45's!" she said. "Looking good!" 4:45's? I glanced over my shoulder and there they were, right behind me - the 4:45 pace group! I could hear their pace setter talking to the group. "We're almost there," she said. "We need to keep this pace, but if you feel like you can run faster now is the time to break away and finish!" So what if she wasn't talking to me? It still applied! I picked up my pace and left the 4:45s behind. I was so close! Miles 26-26.2. 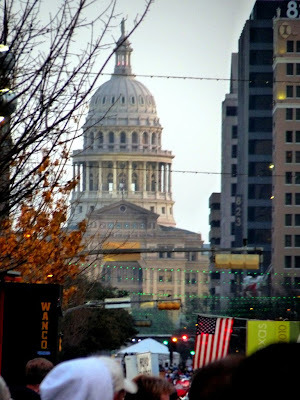 I knew that the race would end at the Capitol, and when I turned the last corner and saw it, I nearly cried. 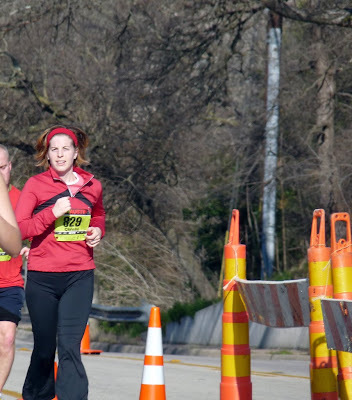 I ran straight for it, rounding a never ending bend, passing people who were limping for the finish line, ignoring the pain in my knees and ankles. And then I was crossing the finish line! I slowed down. Someone handed me a medal. Someone else gave me a bottle of Gatorade. I saw Nathan behind a fence and held back a sob - but barely. I was done. 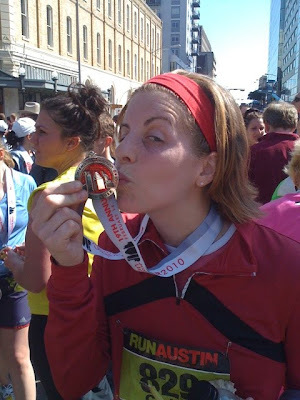 I was a marathoner!